As I work away on Sue Garman’s “Friends of Baltimore”, I keep asking myself…”How crazy am I?” These teeny, weensy pieces are a little…..tiny! This is the actual freezer paper pattern. First I made the tiny outer blue circle. Then, the teeny, tiny yellow inner circle. Here is the flower, before the centre is added. And here is the finished flower! This is what I have accomplished so far! …and here is what I have completed so far! It is starting to have an “almost finished” look to it! I am enjoying watching your progress. The tiny pieces will make a nice addition and worth the effot. Thanks for checking in and seeing my progress! Incredible work you are doing, first your applique! I have been following your progress and love how you describe your journey. Your Bouquet for a New Day is just stunning the quilting is perfect, are you using a hoop? or lap quilting without. Your stitches are so precise! Thanks for checking out my progress. 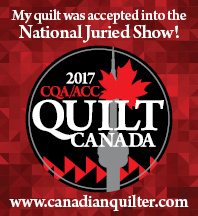 I use 14″ hoop to do my hand-quilting. I purchased a Q-Snap floor frame, but did not have much luck! I went back to my hoop. Not braver…just crazy! But I am loving every minute of it! Yep! You are crazy! LOL. It’s looking so pretty! I’m glad you are finding time and effort to keep plugging away!! You may be crazy but it’s worth it!